Margaret Goodson and Sheila Kelly both recently finished Maidens of the Sea. 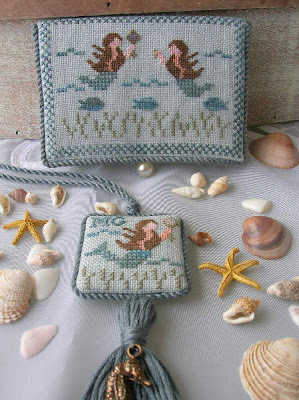 Here are photos of Sheila’s Maidens of the Sea -- just wonderful! Next are Margaret’s photos--also wonderful! Didn’t both ladies do a beautiful job with their stitching, finishing, and photography? Margaret and Sheila are wonderful stitching buddies. Although both ladies are British by birth, they didn’t meet each other until after they both moved to Spain. I asked Margaret and Sheila to share the story of how they first met and developed their special friendship. Margaret wrote, “I believe Sheila took early retirement and moved permanently to Spain about six months before I did which must be about five years ago now. I remember seeing her posts on the Legacy board where she signed off as "Sheila in Spain" and I think I emailed her before we left UK to ask about Internet connection in Spain and a few other things. “We were not in contact again until a couple of years ago when Sheila came across my blog and contacted me again. We discovered we were living only one hour away by car so we arranged to meet. 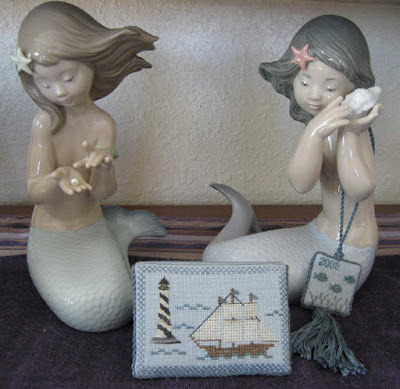 “We quickly became good friends discovering that we have much in common especially our mutual love of all things nautical and, in particular, mermaids! We try to get together about once a month and have the best time stitching and chatting about all things to do with stitching! “I remember the first time I visited Sheila's house and laughing to find that we had stitched so many of the same designs. The only difference is that hers are framed and on the walls while mine are wrapped around a cardboard tube! 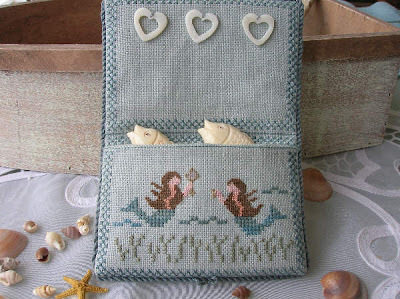 “Sheila had stitched her Maidens of the Sea about a year before I stitched mine. She was a bit daunted about the finishing so we decided to tackle it together. We had a couple of finishing sessions and we were both pleasantly surprised that, thanks to your clear instructions it wasn't anywhere near as difficult as we had imagined. 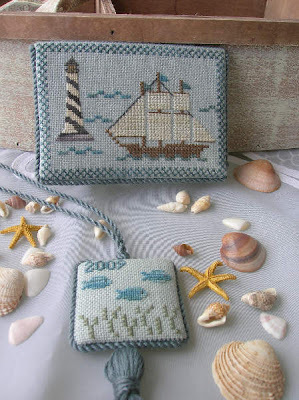 Thank you, Margaret and Sheila, for sharing photos of your wonderful work and also for telling us about your special friendship that developed because of your shared needlework passion. 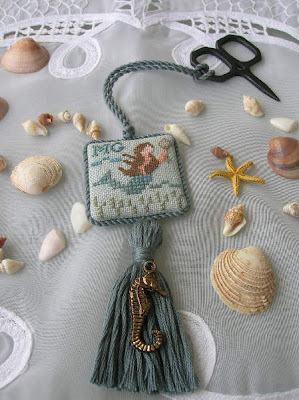 Thanks for featuring our Maidens of the Sea on your blog. I got quite a kick out of seeing them featured here. 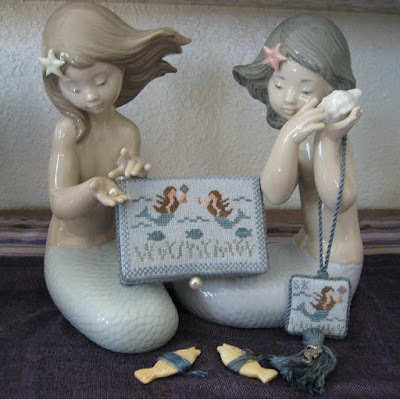 Don't you just love those little porcelain mermaids that Sheila used to display her pieces? She had better keep them under lock and key when I am over there! Beautiful work and nice story about how stitching can bring us together in special friendships. I am staying with my family in Russia now and unfortunately my laptop can't open your e-mail address link to send you the picture of the finished "Flowers of Olde". When I am back home, I will try to send you pictures from my PC. I am sorry for such delay. But I want to tell you that I enjoyed stitching your design very much. Thank you for sharing your work with us. 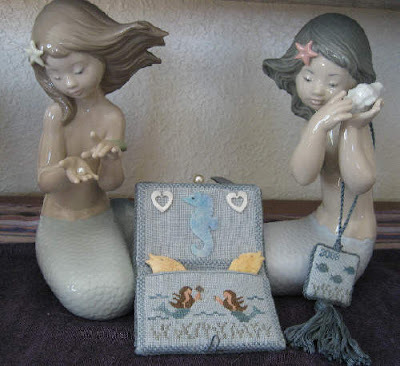 Sheila and Margaret made a fantastic job on their "Maidens of the Sea". Sheila and Margaret both do such beautiful work and I am hoping my Maidens will look just as good when I get her stitched during my forthcoming holidays. What they didn't tell you about was the eating that the ladies get up to on their days together, Margaret emails me to tell me what goodies she has cooked up :o)) Long live friendships. OOO Merveillous work from Margaret and Sheila!!! Thank you, Margaret and Sheila, for sharing photos of your work and also information about your friendship. Chrissie and Sandra, when I wrote about Margaret and Sheila, I thought about the two of you and your special friendship. Were you all able to meet in person as planned? Olga, I'm looking forward to getting a photo from you when it is convenient. Naughty Sandra letting the cat out of the bag LOL. Yes, I love to cook and bake so I usually make scones to have with morning coffee on the days Sheila and I get together. Lunch has to be something quick and easy so that it doesn't cut into our stitching time! Sandra is another lovely stitching friend but we have never met and I'm just starting to get to know Chrissie. I know those two are going to meet up soon when Sandra visits Australia.